Now offering even more reward options for your Checking Account! You can choose what Reward best fits YOU! 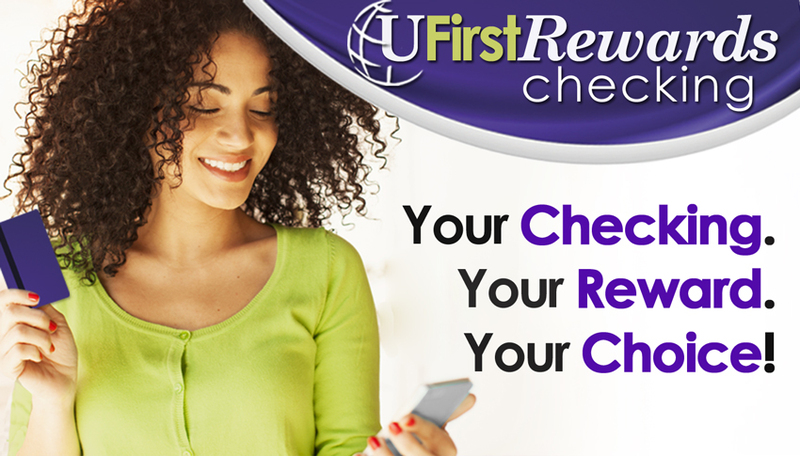 Contact us to set up your UFirst Reward Checking Account today! Cash Rewards Checking can provide you an above market rate on a monthly average daily balance up to $10,000 in your checking account, plus reimburse you for ATM withdrawal surcharges° you may receive from other locations. Contact the Credit Union to select the Cash Reward Checking Accounts. Make sure you meet the monthly requirements (listed below). You will receive your Reward at the end of the month! °The maximum for ATM reimbursement is $25.00 per month. Debit Card Transactions must have a minimum transaction amount of $5.00 each. Debit Card transaction must clear the account by the end of the month to qualify for the 15 transactions. Cash Back Rewards Checking can provide you 1% cash back on your Debit Card purchases (up to $10 a month), plus reimburse you for ATM withdrawal surcharges you may receive from other locations. Contact the Credit Union to select the Cash Back Reward Checking Accounts. iRewards Checking will reimburse you for purchases made from the iTunes or Google Play Store (up to $10 a month), plus reimburse you for ATM withdrawal surcharges you may receive from other locations. Contact the Credit Union to select the iReward Checking Accounts. Q: What happens if I don’t meet the qualifications this month for the UFirst Reward Checking? A: If you do not qualify for a UFirst Rewards Checking in a given month, you will still remain in that reward level but your account will not receive the monthly reward and you will not receive any ATM withdrawal surcharge reimbursements. You do not need to re-enroll in the UFirst Rewards Checking account. If you qualify next month, you will receive your rewards. Q: Can I qualify for multiple UFirst Reward Checking accounts? A: No, you can only have one UFirst Reward Checking account per SSN. Q: Can I change to a different UFirst Reward Checking account type? A: YES! Just contact the Credit Union and let us know what type you would like to change to. Q: Can I qualify for a UFirst Reward Checking account on my Business Account? A: No, UFirst Reward Checking accounts are for Personal Accounts only.